Congratulations to the following students for being selected for the PBIS Award of Cooperation: Jaedyn McDonald, Eli Alvarez, Ryder Pounders, Rayden Mabry, Weston Fisher, Kammeron Dallas, Konner Duncan, Gracelyn Webb, Tyler Smith, Morgan McCutcheon, Bryce Rouse, Alex Roberts, and Jada Bates. Students who exhibited positive behavior throughout the third quarter were treated to a magic show by Michael Clayton as a reward for following the expectations of having respect, preparing yourself, and showing responsibility. Dr. Carolyn Tyler, Dyer County Schools Elementary Supervisor, spoke with Leadership Team students about perseverance, grit, self-discipline, responsibility, bravery, and learning from failure. She encouraged students to find their passion, set goals, and a good work ethic. Thank you Dr. Tyler for all that you do for Dyer County Schools. Congratulations to the following students that were selected for the February character trait of Friendship: Channing Howell, Maliyah Spence, Maggie Kirk, Yoana Arellanes, Aubree Cannon, MaKenzie Long, Riley Braden, Anna Morris, Khloe Gilliland, Madison McLeod, Kailey Richardson, Corde Starks, and Cordillia Kempfer. Miss Tennessee, Christine Williamson, spoke to the students at Holice Powell about the character trait of Respect. She encouraged each student to have respect for their friends, family, and yourself. Miss Tennessee proudly serves as the Governor's Spokesperson for Character Education in Tennessee. As a thank you to our Adopt-A-School partner, Dyersburg Electric, Leadership students made all DES employees a gift bag and wrote each one a note of thanks for being such a phenomenal partner in education. Congratulations to the following students that were selected for the PBIS Respect Award: Olivia Smith, Leanna Ross, Ryder Pounders, Ethan Jones, Will Smith, Miles Hayes, Maria Lopez, Cayden McLeod, Kierra Midkiff, Braydon Gonzales, Kylee Jowers, Jake Elliott, and Sadie Wofford. Third-fifth grade has gotten to visit the STEAM bus. STEAM is an acronym for science, technology, engineering, arts, and mathematics. Third grade has been working on magnetism, fourth grade potential and kinetic energy, and fifth grade has tested the effects of balanced and unbalanced forces on speed and direction of motion. Congratulations to these students for being selected as the Dyersburg Kiwanis Terrific Kid Award. Congratulations to these students for making the Honor Club for the second nine weeks. Congratulations to these 3rd grade students for making the Golden Honor/Honor Club for the second nine weeks. Congratulations to the following students that were selected for the PBIS Character Trait of the Month, the Compassion Award: Wesley Smith, Clayton Vires, Lyric Eskridge, Beau Needham, Kynley Adams, Jayden Jernigan, Caylee Cooper, Madilyn Ozment, Fiona Cunningham, Caylyn Hobson, Wyatt Langford, Selena Gourley, and Natalie Robbins. Every Holice Powell student received their very own Christmas book to keep thanks to our Adopt-A-School partner, Dyersburg Electric System. We are so thankful for their generous support of our school and our students. ❤️💚❤️💚❤️ Pictured are the HPS Student Ambassadors from each class with some of the DES employees. Zack Langley, Associate Pastor of Students and Worship at Hillcrest Baptist Church, spoke to our Leadership Team today. He spoke with them about serving others, doing outreach to the community, making friends, and building relationships with others. Christmas Family Literacy Night: Merry Christmas, Charlie Brown! Holice Powell hosted a Christmas Family Literacy Night. Students in grades Prek-5 along with their families were invited for a fun family night with a Charlie Brown Christmas theme. Families rotation through four stations including the reading of "A Charlie Brown Christmas", music, painting, photo booth, and snacks. The following students were selected for the PBIS character trait of Thankfulness for November: Ariiyannah Weber, Kenzleigh Kidd, Bo Tidwell, Baily Hall, Rachel Kesterson, Nia Connelly, Easton Hurst, Bobbie Webb, Jaxen Yarbro, Justice Chapman, Peytton Hill, Shawhn Jones, and Leigha Parnell. Our Leadership Team went to the Highlands of Dyersburg to bring the residents treats, play bingo with them, and recite a Veterans Day poem.We are proud of these students for using part of their Saturday to serve others. 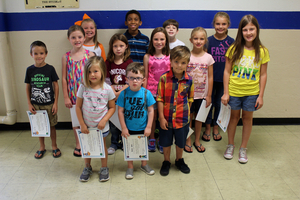 Congratulations to the following students that were chosen for the PBIS Responsibility Award: Ally Parnell, Kaleb Gray, Grace Vestal, Makayla Welch, Aylissah Bolden, Olivia Howell, Baylee Parker, Cayden McLeod, Dayana Antunez, Jarett McCutcheon-Hayes, Callie Witherington, Breanna Pleasant, and Kloie Doolin. 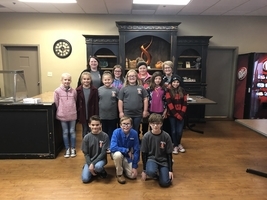 The following students were selected for the Dyersburg Kiwanis Terrific Kids Award: Olivia Smith, Eli Alvares, Skylar Elgin, Rayden Mabry, Weston Fisher, Olivia Howell, Maria Lopez, Camron Warren, Makayla Long, Jarett McCutcheon-Hayes, Wyatt Langford, Garrett Rogers, and Natalie Robbins. Congratulations to the following students who were chosen as outstanding examples of our Helpfulness Award:Jovi McCall, Kasen Jones, Collin Kempfer, Ryder Walton, Madelyn Campbell, Alyssa Yarbro, Addison Riddick, Dixie Tripp, Ava Pearson, Tony Russell, Rylee Dunaway, Cooper Howell, and Emma McGavock.